* Really? Syrian President Bashar Assad is that crazy, using chemical weapons in broad daylight against his own people, even though he knew he would be held culpable. Israelis have noted the rows and rows of gassed bodies wrapped eerily in white shrouds less than 200 miles from Jerusalem and Tel Aviv. * Wall Street Journal editorial: President Obama’s Syrian melodrama will go down as one of the stranger gambles, if not abdications, in Commander in Chief history. For days his aides had been saying the President has the Constitutional power to act alone in response to Syria’s use of chemical weapons, and that he planned to do so. On Friday, he rolled out Secretary of State John Kerry to issue a moral and strategic call to arms and declare that a response was urgent. * If the point of the bombing is primarily to “send a message,” as the President says, well, then, apparently Congress must now co-sign the letter and send it via snail mail… Around the world Obama has so far mobilized mainly a coalition of the unwilling, with even the British Parliament refusing to follow his lead. By comparison, George W. Bush on Iraq looks like Metternich. * Unlike the British in 1956, the U.S. can’t retreat from east of Suez without grave consequences. The U.S. replaced the British, but there is no one to replace America. * Dominic Lawson: “Forget the massacre of thousands in Syria and Egypt, whether by chemical weapons or more conventional methods of mass slaughter. The Middle Eastern issue galvanising some of our musical mega-stars and their followers, even now, is the treatment by Israel of Palestinians. A fortnight ago the violinist Nigel Kennedy told the audience at the BBC Proms concert that Israel should “get rid of apartheid”. * When the wave of popular uprisings sometimes known as “the Arab Spring” reached Syria, Damascus’s envoy in London went on BBC’s Newsnight to tell a clearly startled Jeremy Paxman that “the Israelis could be behind it.” Actually, the Israeli government was most discomfited by the uprisings in the region. It is Israeli citizens who are now stampeding for gas masks. * David Horovitz: Though dutifully silent in public … the Israeli political and security leadership is privately horrified by President Obama’s 11th-hour turnaround on striking Syria… And it is profoundly concerned that the president has set a precedent, in seeking an authorization from Congress that he had no legal requirement to seek – and that Congress was not loudly demanding – that may complicate, delay or even rule out credible action to thwart a challenge that dwarfs Assad’s chemical weapons capability: Iran’s drive to nuclear weapons. * Fouad Ajami: Pablo Picasso immortalized Guernica for the bombing it suffered in the Spanish Civil War. But Guernica was a small market town of 7,000 people, and it was attacked by German and Italian bombers; Aleppo, which endured the brutality of the regime’s fighter planes, is a city of more than 2 million. * The Obama administration has already announced an intended strike of limited duration and magnitude, and done even this with an air of doubt and irresolution. The dictator has already been told that his regime is off-limits. From the very beginning of this terrible war, Assad has been smugness itself. He had warned the rebels that no foreign cavalry would ride to their rescue. Borrowing a page from the book of his late father, Assad has openly proclaimed that America did not have the stamina for tests of strength in the Levant. I attach five articles below. The writers of all these pieces are long-time subscribers to this email list. David Horovitz is the editor of The Times of Israel (and previously editor of The Jerusalem Post). Herb Keinon is the diplomatic correspondent of The Jerusalem Post. Fouad Ajami is a senior fellow at Stanford University’s Hoover Institution. He was born to a Shia family in Lebanon. But on Friday night, according to leaks from this leakiest of Administrations, the President changed his mind. A military strike was not so urgent that it couldn’t wait for Congress to finish its August recess and vote the week of its return on September 9. If the point of the bombing is primarily to “send a message,” as the President says, well, then, apparently Congress must co-sign the letter and send it via snail mail. It’s hard not to see this as primarily a bid for political cover, a view reinforced when the President’s political consigliere David Axelrod taunted on Twitter that “Congress is now the dog that caught the car.” Mr. Obama can read the polls, which show that most of the public opposes intervention in Syria. Around the world he has so far mobilized mainly a coalition of the unwilling, with even the British Parliament refusing to follow his lead. By comparison, George W. Bush on Iraq looks like Metternich. But what does anyone expect given Mr. Obama’s foreign-policy leadership? Since he began running for President, Mr. Obama has told Americans that he wants to retreat from the Middle East, that the U.S. has little strategic interest there, that any differences with our enemies can be settled with his personal diplomacy, that our priority must be “nation-building at home,” and that “the tide of war is receding.” For two-and-a-half years, he has also said the U.S. has no stake in Syria. The real political surprise, not to say miracle, is that after all of this so many Americans still support military action in response to Syria’s use of chemical weapons – 50% in the latest Wall Street Journal-NBC poll. Despite his best efforts, Mr. Obama hasn’t turned Americans into isolationists. The problem with the intervention that Mr. Obama is proposing is that it will do little or nothing to end the civil war or depose Assad. It is a one-off response intended to vindicate Mr. Obama’s vow that there would be “consequences” if Assad used chemical weapons. It is a bombing gesture detached from a larger strategy. This is why we have urged a broader campaign to destroy Assad’s air force and arm the moderate rebels to help them depose the regime and counter the jihadists who are gaining strength as the war continues. All of which means that the adults in Congress – and there are some – will have to save the day. The draft language for authorizing force that Mr. Obama has sent to Congress is too narrowly drawn as a response to WMD. Congress should broaden it to give the President more ability to respond to reprisals, support the Syrian opposition and assist our allies if they are attacked. The Israeli political and security leadership is privately horrified by President Barack Obama’s 11th-hour turnaround on striking Syria – a decision he took alone, after he had sent his Secretary of State John Kerry to speak out passionately and urgently in favor of military action. It is now fearful that, in the end, domestic politics or global diplomacy will ultimately lead the US to hold its fire altogether. It is worried, furthermore, at the ever-deeper perception of Obama’s America in the Middle East as weak, hesitant and confused – most especially in the view of the region’s most radical forces, notably including Bashar Assad, Hezbollah, and Iran. And it is profoundly concerned that the president has set a precedent, in seeking an authorization from Congress that he had no legal requirement to seek – and that Congress was not loudly demanding – that may complicate, delay or even rule out credible action to thwart a challenge that dwarfs Assad’s chemical weapons capability: Iran’s drive to nuclear weapons. But privately, Israel’s silently appalled political and security leaderships have no doubt that Obama’s last-minute change of heart harms Israel’s security interests far more critically than any marginal minister’s inconvenient outburst possibly could. Kerry and Defense Secretary Chuck Hagel are reported to have briefed Israel’s leaders to the effect that Obama’s firm intention remains to strike back at Assad for what Kerry said Friday was the carefully planned August 21 use of chemical weapons to kill over 1,400 of his own Syrian people. The Israeli leadership wants to believe that this is the case. The notion that the US would turn its back on the toxic crimes of a murderous dictator, whom Kerry bracketed Sunday with Adolf Hitler and Saddam Hussein, is too dire to consider in an Israel facing more than one hostile regime relentlessly seeking to exploit any military and moral weakness in order to expedite the Jewish state’s demise. Though dutifully silent in public, Jerusalem has quickly internalized the damage already done – by the sight of an uncertain president, all too plainly wary of grappling with a regime that has gradually escalated its use of poison gas to mass murder its own people; a regime, moreover, that can do relatively little damage to the United States, and whose threats Israel’s leadership and most of its people were taking in their stride. At the very least, Obama has given Assad more time to ensure that any eventual strike causes a minimum of damage, and to claim initial victory in facing down the United States. At the very least, too, Obama has led the Iranians to believe that presidential promises to prevent them attaining nuclear weapons need not necessarily be taken at face value. If a formidable strike does ultimately come, some of that damage can yet be undone, the Israeli leadership believes. American military intervention can yet be significant – in deterring Assad from ongoing use of chemical weapons, and bolstering American influence and credibility in the region. But if Russia’s President Vladimir Putin, who will be hosting the G20 later this week, inserts himself into the equation, and Obama is distracted by endless machinations ostensibly designed to see Assad stripped of his chemical weapons, machinations that ultimately are sure to lead nowhere, the damage will only deepen. If there is no strike, the United States – hitherto Israel’s only dependable military ally – will be definitively perceived in these parts as a paper tiger, with dire implications for its regional interests. And for Israel. Jerusalem is worried, too, of a direct line between requesting Congressional approval for military action against Syria – a relatively straightforward target – and feeling compelled to honor the precedent, should the imperative arise, by requesting Congressional approval for military action against Iran – a far more potent enemy, where legislators’ worries about the US being dragged deep into regional conflict would be far more resonant. Israel remains hopeful that, to put it bluntly, Obama’s America will yet remember that it is, well, America. The alternative, it rather seems, is something the leadership in Jerusalem finds too awful to so much as contemplate just yet. This kind of international dallying is not the type of behavior that will instill confidence in Israeli leaders that they can count on the world when it comes to Iran and its nuclear capabilities. “If we won’t enforce accountability in the face of this heinous act, what does it say about our resolve to stand up to others who flout fundamental intentional rules, to governments who would chose to build nuclear arms, to terrorists who would spread biological weapons, to armies who carry out genocide?” the president asked. Iran, he said and Obama implied, was watching carefully to see how the world would respond to its client state’s use of chemical weapons. Will there be massive rhetorical outrage followed by determined military action by the entire world? Will there be immediate military action? Will there be massive rhetorical outrage followed by limited action by the US? How limited will the action be? Will the pain be bearable? But the Iranians are not the only ones watching. So is Israel. Whether or not Israel decides to act against Iran could be determined in large part by how the world acts now against Syria. And the British parliament’s vote Thursday against military action is not a great sign. And Bennett’s post came even before Obama’s address in which he said that the US would conduct a limited military action against Syria, but only if Congress approved it when it came back from its summer recess on September 9. Really? Syrian President Bashar Assad is that crazy, using chemical weapons in broad daylight against his own people, even though he knew he would be held culpable. The French speak tough, the British back down completely, and Obama says he will take limited action if Congress approves when it comes back from summer vacation. The Iranians, watching this show, are surely calculating what action they could expect if they run at full speed to nuclear capability. One could not blame them for concluding that the French will speak tough, the British will vote military action down in parliament. And Obama will bring the matter to Congress for a vote if Congress is in session. If not, he will wait patiently until Congress re-convenes to ask its opinion. That kind of international dallying is not the type of behavior that will instill confidence in Israeli leaders that they can count on the world when it comes to Iran. Besides, if this is how the world acts when some 1,429 people are gassed, how should we expect them to act if Iran just crosses the nuclear threshold, but doesn’t kill anybody yet? If gassing 1,429 people, including at least 426 children, as US Secretary of State John Kerry said on Friday, does not lead to a military assault, will the crossing of the nuclear threshold – when no one is killed – trigger a response? The Iranians are carefully watching the world’s response to the Syrian atrocities. If the response is not harsh enough, or swift enough, or serious enough, they may very well conclude that they would face a similar type of situation and read that as a green light to proceed with their nuclear program at full throttle speed. The Israelis are also watching the world reaction. And Israel, too, may very well conclude that if the world’s response is not harsh enough, or swift enough, or serious enough, then they too will feel that they have a green light to take action to stop the Iranians. The lack of a strong international response in the face of rows and rows of gassed bodies wrapped eerily in white shrouds just 220 kilometers from Jerusalem might not compel Israel to take action against Assad, but it surely may compel it to think twice about relying on the world to rid it of the Iranian nuclear menace. Syria is the moral and strategic test that U.S. President Barack Obama neither sought nor wanted. He had done his best to avert his gaze from its horrors. He, the self-styled orator, had said very little about the grief of Syria and the pain of its children. When he spoke of Syria, it often sounded as though he was speaking of Iraq – the prism through which he saw the foreign world and its threats. In his first term, his four principal foreign policy advisers – the secretaries of state and defense, the director of the Central Intelligence Agency, and the chairman of the Joint Chiefs of Staff – supported arming the rebellion in Syria: He overrode them. Earlier this year, he himself promised the rebels weapons that were never delivered. History will record for Obama that it was Bashar al-Assad who dragged him into this fight. Obama had made much of the distinction between wars of choice and wars of necessity. He is said to have pondered theories of just and unjust wars. To this Syrian ordeal, he came late in the hour, after the barbarisms, after the veritable destruction of Syria’s nationhood, after the jihadis had carved out their emirates. It doesn’t matter much whether this entanglement is one of choice or of necessity. This is only partly a hand that Barack Obama was dealt. To a greater extent, he has shaped the conflict with the passivity he opted for in a standoff with a petty dictator who should have been thwarted long before. Obama now makes his stand the lawyerly way, on very narrow grounds – the use of chemical weapons in the Ghouta, east of Damascus. True, the use of chemical weapons was a transgression all its own, the first since Saddam Hussein’s campaign of death and ruin in Kurdistan a quarter-century ago. But Assad had sacked and reduced to rubble ancient, proud cities. He had ignited a religious war between Sunni and Shiite Islam; he had sent vigilante squads to maim and kill across a volatile fault-line between Sunni and Alawite towns, with the transparent aim of “cleansing” whole communities. The peace and fabric of an old, settled country has been torn to shreds as its people have fled in terror into neighboring states. A million children, 740,000 of them younger than 11, the United Nationsestimates, have been made refugees. Why indict Assad on the chemical weapons attack on the Ghouta alone? One would think that the use of airpower against civilian populations would have sufficed as a trigger for military intervention. Pablo Picasso immortalized Guernica for the bombing it suffered in the Spanish Civil War. But Guernica was a small market town of 7,000 people, and it was attacked by German and Italian bombers; Aleppo, which endured the brutality of the regime’s fighter planes, is a city of more than 2 million. The Obama administration has already announced an intended strike of limited duration and magnitude, and done even this with an air of doubt and irresolution. The dictator has already been told that his regime is off-limits. From the very beginning of this terrible war, Assad has been smugness itself. He had warned the rebels that no foreign cavalry would ride to their rescue. Borrowing a page from the book of his late father, Assad has openly proclaimed that America did not have the stamina for tests of strength in the Levant. It is an unfortunate fact of Arab political life that adventurers can walk out of the wreckage of bitter defeats and claim victory before the gullible. Consider the trail: In 1991, the U.S. inflicted an overwhelming defeat on the regime of Hussein, but the Iraqi despot was spared, and the “Arab Street” that had rallied to him was never convinced that their hero had faltered. Seven years later, during the presidency of Bill Clinton, it was time to go at Hussein again. Operation Desert Fox, an Anglo-American campaign, was meant to punish the Iraqi despot for his defiance of UN inspectors looking into his weapons programs. After four days of strikes, the thing came to an end, and Hussein took it as evidence of the weakness of Western powers. In 2006, the leader of Hezbollah ignited a war on the Israeli-Lebanese border. He spun his own legend about the “divine victory” that his militia had secured. There had been death and economic ruin in Lebanon, but it was enough that Hezbollah was left standing after the fight. The Syrian regime must then be denied the dividends of an inconclusive military campaign. The regime itself – its barons, its secret police, its elite military units and its air bases – ought to be legitimate targets, and the same is true of Assad’s presidential palace. There should be conviction and courage in this fight with the Assad dictatorship. The truth of it is that the (Sunni) Arab world is now full of animus toward the Syrian ruler and his cabal. No tears will be shed for Assad. The vast majority of Arabs must dream of an end for him similar to the macabre fate that befell Muammar Qaddafi. The unwillingness of the League of Arab States to support a military effort against Assad’s regime is a piece with the moral abdication of that group. That body is a league of despots that has never acknowledged truths known to practically all Arabs. No attention ought to be paid to the Arab League and its pieties. The classic Obama concern about antagonizing the sensibilities of the region can be set aside. This is “the East” and Western deeds play out under watchful eyes, in full view of people with a scent for the resolve and weakness of strangers. Obama has proudly proclaimed that he does not bluff. 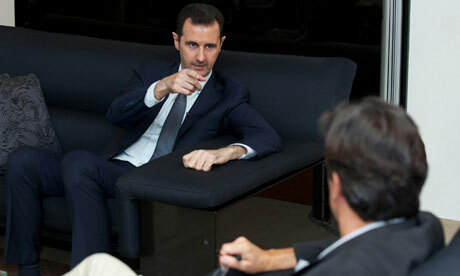 In his bunker, that petty Syrian dictator has called his bluff. So who still thinks Israel is the root of Middle East problems? Forget the massacre of thousands in Syria and Egypt, whether by chemical weapons or more conventional methods of mass slaughter. The Middle Eastern issue galvanising some of our musical mega-stars and their followers, even now, is the treatment by Israel of Palestinians. A fortnight ago the violinist Nigel Kennedy told the audience at a Proms concert that Israel should “get rid of apartheid” – his tendentious reference to the treatment of the Arab minority within that country. This remarkable suggestion that the BBC was acting as state censor on behalf of government (rather than merely demonstrating its own determination not to see its great music festival turned into a platform for contentious political slogans) is an example of how the state of Israel makes so many people lose all sense of perspective. So it goes with Pink Floyd’s Roger Waters who immediately issued a call to arms “to my colleagues in rock’n’roll” over the treatment given to “my brother Nigel Kennedy.” Waters denounced “one Baroness Deech (née Fraenkel), who disputed the fact that Israel is an apartheid state”. What’s with the “née Fraenkel”? Presumably this is the rock star’s way of letting us know that Deech is – aha! – a Jew. Enough said – although Waters did go on to say: “I have many very close Jewish friends”. Perhaps some of those friends – whether or not they adhere to Jewish dietary laws – might be tiring of his latest porcine stunt, in which Pink Floyd’s pig balloon is imprinted with a Star of David before being “symbolically” shot down. With a delightful irony, this active boycotter of all things Israeli is now himself facing calls to be boycotted, from the admittedly small Jewish population of Dusseldorf, which German city is Waters’ next destination on his current tour. You might dismiss this as completely irrelevant to the slaughter on the streets of Damascus – and in any rational sense it is – were it not for the fact that the Syrian Free Press, one of Bashar-Al Assad’s propaganda outlets, has been extolling Waters in recent weeks (when not too busy claiming that the murder of hundreds of children by Sarin nerve gas was actually organised by the CIA on behalf of Israel). Actually, the Israeli government was most discomfited by the uprisings in the region, rather preferring the dictators it knew to the possibility of Islamist regimes in their place. It is Israeli citizens who are now stampeding for gas masks, not those of the US, in preparation for what might follow if President Obama does unleash part of America’s vast arsenal in the direction of sites believed to hold Assad’s chemical weapons. It is true that Israel in 2007 sent eight fighter jets laden with 17 tons of high explosives to demolish the Dair Alzour site in Syria, which the International Atomic Energy Authority has since concluded was the base of a “gas cooled graphite moderated nuclear reactor not configured to produce electricity…built with the assistance of the Democratic People’s Republic of Korea.” So Israel is indeed ferociously single-minded in pursuing its self-defence within the region. Yet the idea that Israel is the proximate cause of any tension within that part of the world – and therefore of the sea of blood sweeping through Egypt and Syria – is paranoiac when not deliberately mendacious. In many cases, the origins of the problems go back to the death of the prophet Mohamed, and the split between the followers who believed his successor should be appointed under Arab tribal tradition –later known as the Sunni – and those who insisted his successor should be from his family, and nominated Mohamed’s cousin and son-in-law Ali – the group which became known as Shia muslims. In certain Arab countries, power had been held for generations by the Sunni, even while a majority of the population might have been Shia. This was the case in Iraq, where a sectarian civil war was precipitated by the disastrously misconceived US invasion. The opposite is true of Syria, a majority Sunni country, yet ruled by Alawites, a branch of the Shia. Not surprisingly, the rebels there are overwhelmingly Sunni, backed by the Sunni regimes of Saudi Arabia and Qatar; and Bashar’s main backer is the Shia regime of Iran. This tribal and sectarian dispute, which has the potential to become the Muslim equivalent of the Thirty Years War, has about as much to do with Israel as did the conflict between Catholics and Protestants in Ireland. And the peoples involved care very little, if at all, about the fate of the Palestinians – certainly much less than do Nigel Kennedy and Roger Waters. Hyperbole has surrounded that little nation ever since it was created in 1948 and the secretary of the Arab League pronounced, as five Arab countries launched a joint attack on the one-day-old state: “This will be a war of extermination and a momentous massacre.” Now the exterminations and massacres are Arab on Arab; but somehow it will still be said to be all to do with Israel. I think I made a similar point on this page over six years ago – but unfortunately this is the last of my columns for The Independent. To those readers who have enjoyed reading them as much as I did writing them, I’m sorry to desert you; to those who did not – you can calm down now.